Editor’s Note: This article originally appeared in Issue #10 of the Anglotopia Print Magazine in 2018. Support great long-form writing about British History, Culture, and travel by subscribing to the Anglotopia Magazine. Every subscription helps keep Anglotopia running and provides us to the opportunity to produce articles like this. You can subscribe here. St Paul’s Cathedral is the most magnificent building in London. We’ve visited it often and even climbed the dome, all the way to the top. We try to visit whenever we can. 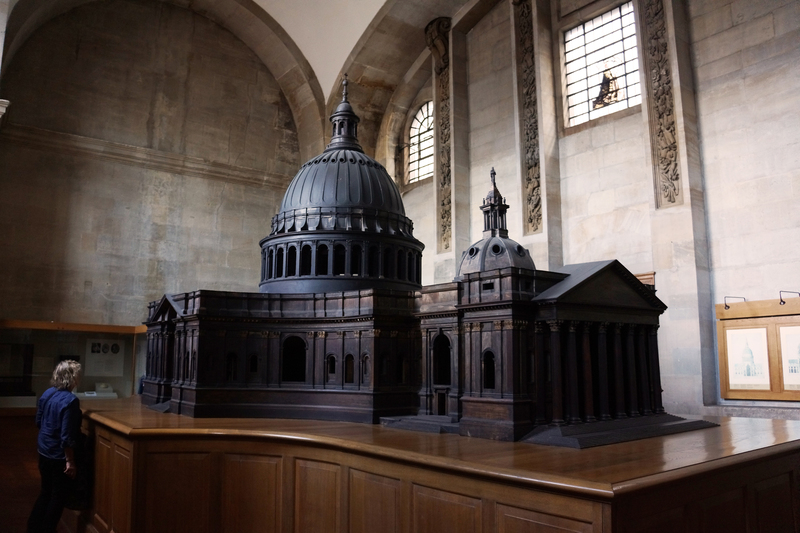 It’s one of the most historically important buildings in London and the view of the cathedral from various angles in London are actually protected – no building can block St Paul’s. So, when I learned last year that there’s a secret tour you can take that goes behind the scenes, I had to book in as soon as possible. Every major cathedral has something called a Triforium. It’s a weird space, often closed off from the public. But the massive scale of a cathedral by design creates a Triforium. What is it? By the stricter definition, it’s a gallery or arcade above the arches of the nave, choir, and transepts of a church. Because of the height and accessibility, they are almost always closed off to the public. As a consequence, these spaces are much more shall we say, institutional, than the rest of the public-facing cathedral. More often than not, they’re used as a storage area for the cathedral. It’s where they put stuff they need out of sight or don’t have room for elsewhere. St Paul’s Triforium is generally closed to the public, but it’s occasionally offered in special tours a few days out of the month. 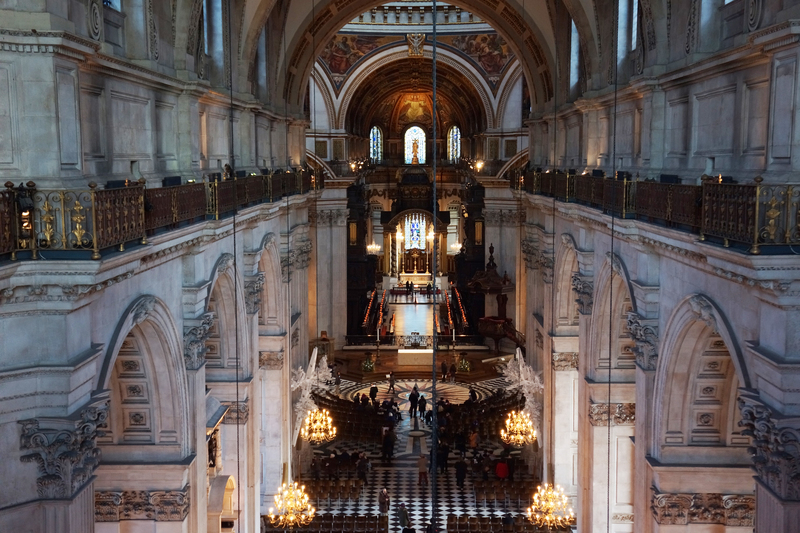 The St Paul’s Triforium is special though because it provides an insight into the very construction of the cathedral by Sir Christopher Wren after the Great Fire of London. To say I was excited about exploring what is essentially the attic of St Paul’s Cathedral is an understatement. We arrived early for our tour (after a marathon drive from Dorset to make it there in time). So, we went down the crypt for a quick lunch before our tour started. The group was small, no more than 10 people. After we were all gathered around, we were led to the main public staircase and up a few flights of stairs. Then we stopped and waited as the tour guide unlocked the door that’s normally closed to the public. What a treat. 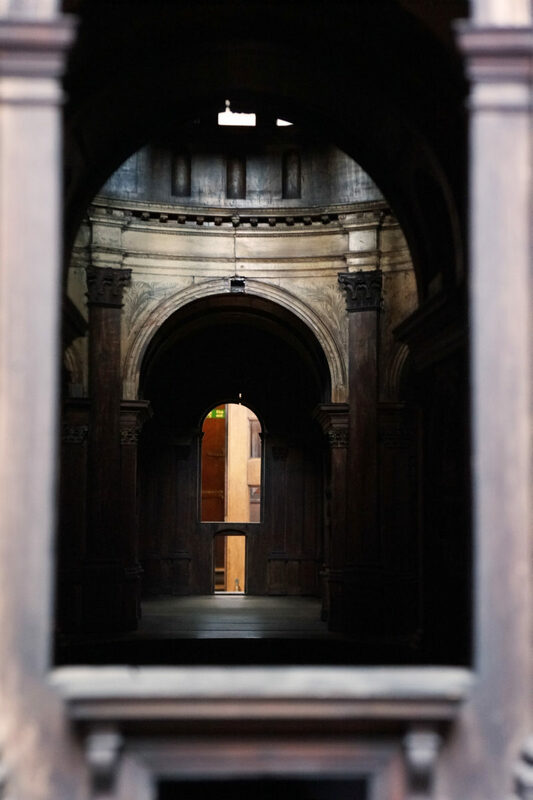 Once we were through the door, we were lead along a corridor and finally arrived at a spot that offered up an incredible view across the entire nave of St Paul’s. They call this the ‘BBC View’ as this is where cameras are usually placed for big state occasions. The perk of this tour is that we were allowed to take pictures, something that’s usually forbidden in St Paul’s. So, all of us took tons of pictures. How could we not when the rare treat afford by this view? We were then led through a corridor that had low ceilings but was filled with artifacts. They ranged from works of art no longer needed to various stone artifacts from the cathedral’s history. 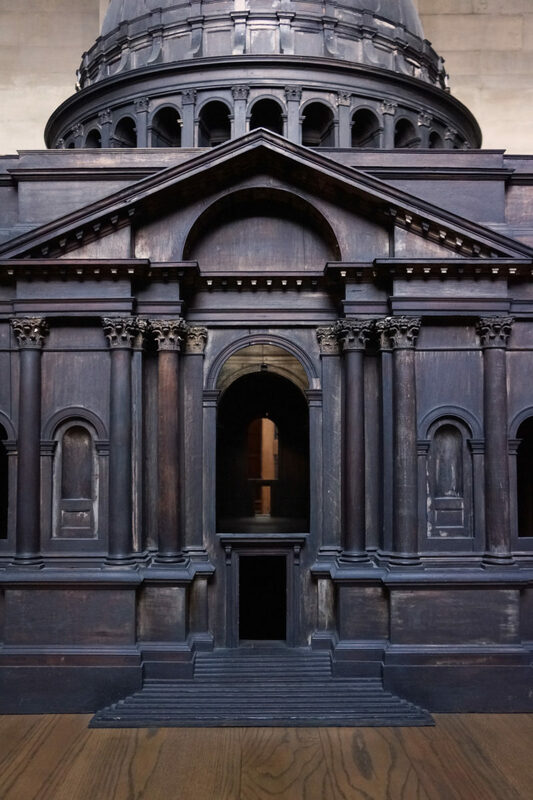 There has been a church of some form at the site of St Paul’s Cathedral since 604 AD. The star of this room, though, were the pieces of the original ‘Old St Paul’s’ that burned down its great fire. They’re just sitting there on a shelf, away from the public eye, which is a real shame because they’re remarkable. Then we’re led to another corridor where the choir and clergy store their robes. You get the sense that this is a very private space. 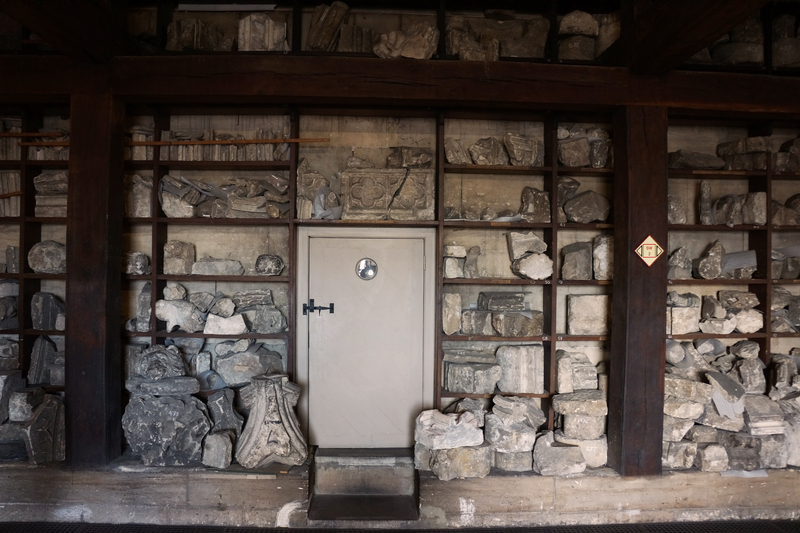 There you’ll find detritus from the cathedral’s history from old altars to sketches of possible architectural plans. And then the real highlight of the tour. Sir Christopher Wren faced lots of challenges trying to get across his vision for a new cathedral and his designs went through many iterations as various stakeholders tried to have their say. Finally, when Wren wanted to convince the patron who mattered the most – King Charles II, he did something rather drastic. He built a massive wooden scale model of his vision. So big that the King could go inside it to get a sense of scale. This wooden model, a treasure of national importance, still exists and is the main attraction you see on this tour. It’s in a special room that was originally supposed to be the second library but instead has been turned into a permanent exhibition for the wooden model. Made to scale of 1:25, this model represents the design. It was intended to be a permanent record, in case Wren died to show clearly his vision. It was designed to be walked through at eye-level to suggest the experience of the real interior. 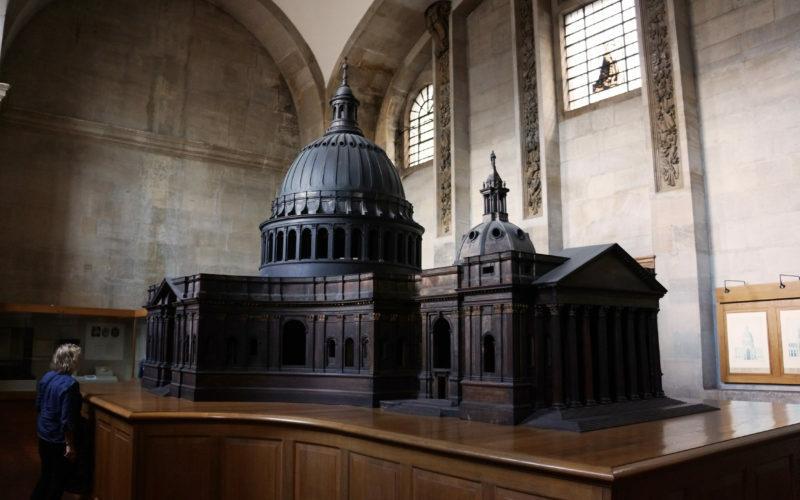 The model was made from full-size drawings scaled up by Wren and his assistant Edward Woodroffe, working at a large table in the Cathedral convocation house. The model was completed in 1674 and cost about £600, a princely sum of money equivalent to the cost of a good London house at the time. Initially, it was painted stone colors inside and out, with grey for the lead of the domes, gilded details, and fictive relief, but the paint has chipped and faded away with time leaving a beautiful dark wood structure in immaculate condition. The King was impressed, and Wren was allowed to continue to pursue his vision though the final cathedral which differs quite a bit from the model. We spent a good amount of time in the room, and it was incredible to see in person. Sadly we were not allowed to go inside of it, which was fine. It was treat enough to be able to see it. You really don’t get an idea of just how massive this model is. Imagine a child’s ‘Wendy House’ and triple the size to give you an idea of scale. Around the modern are framed drawing of Wren’s various incarnations of the designs. And these are reproductions; these are Wren’s actual copies. Remarkable! After the treat of the model room, it was time to venture towards the library. When the giant creaky door was opened to the library, you’re immediately hit with the most magnificent smell. A mixture of old leather, paper, and ink. If you could bottle the smell, it would make an excellent perfume for book nerds. 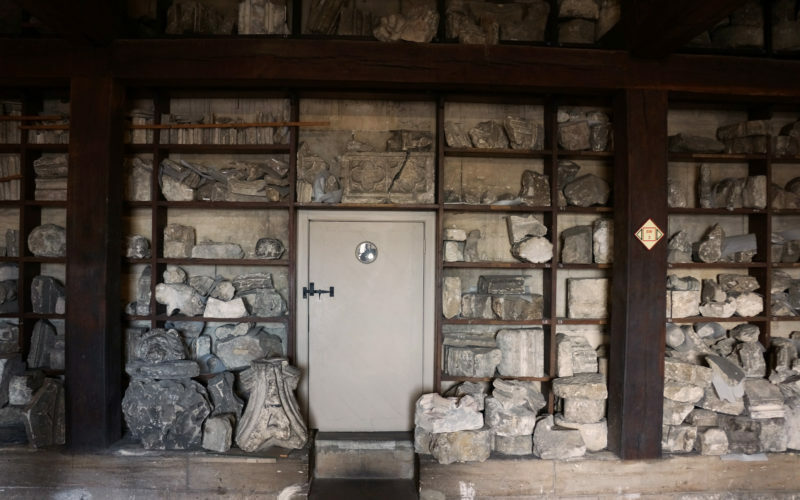 The room is filled wall to wall with old books, with only a few dating back to before the cathedral was constructed. But many were donated as part of a massive collection. The library’s collection was almost mostly destroyed in the Great Fire of London. Wren’s library chamber was restocked by the Commissioners for rebuilding St Paul’s: They bought collections, including valuable Bibles and liturgical texts, and were fortunate to receive a generous bequest in 1712 of nearly 2,000 volumes from the library of Henry Compton, late Bishop of London. In 1783, the library of John Mangey, Vicar of Dunmow and Prebendary of St Paul’s, was added. In the 19th century, extensive collections of ecclesiastical tracts and pamphlets were brought in. It’s a remarkable place, filled with treasures beyond compare. 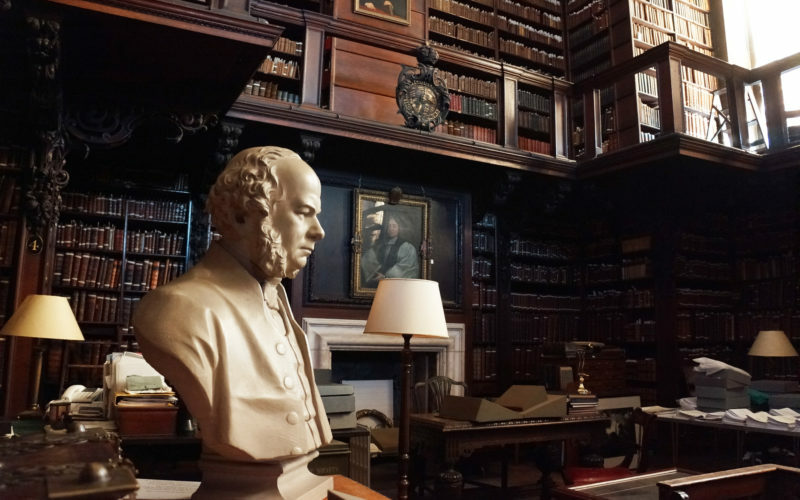 The librarian was there, and he was kind enough to talk to us about the books in the collection and how they care for them, ensuring that they survive the ravages of decay. The library was rather dark, but as it was late in the afternoon, occasionally a beautiful golden sunlight would enter the room and then leave, providing the most beautiful light to admire the collection. When we were ushered out of the library, I didn’t want to leave. From July 2018, the library will be closed off from the public tours as it will undergo an 18-month conservation program. It was a privilege to take part in one of the last public tours. After the library, we were led to a staircase, but not just any staircase. 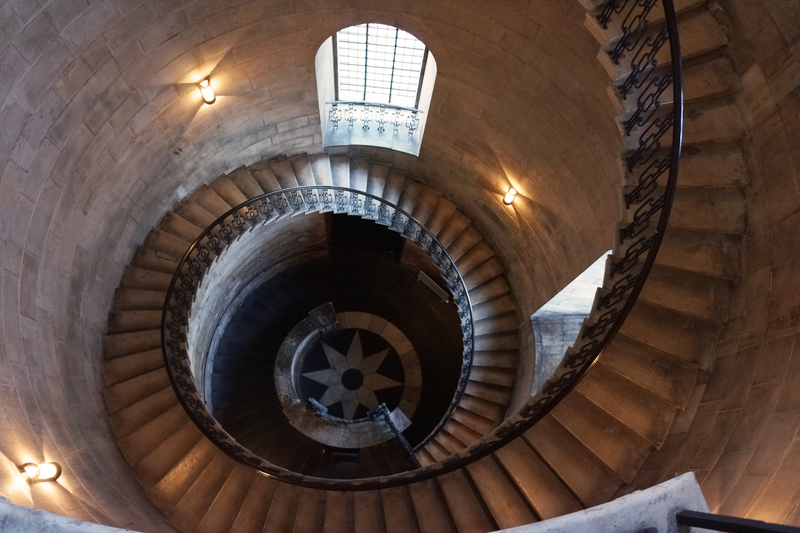 This is the Dean’s Staircase, and the cathedral staff jokingly call it the moneymaker. Because you’ve seen it countless films – most recently in the Harry Potter films. The cantilevered staircase is perfectly balanced. It’s not supported in any way. Each stair is anchored to the wall, and that’s it. Architecture and math in its purest form. 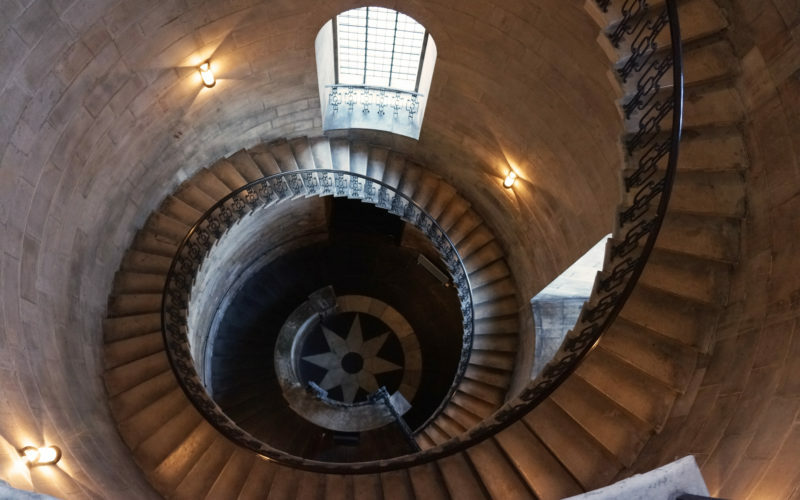 The staircase is more than 300 years old and shows no signs of buckling under its own weight. After that, we returned to the ‘BBC View’ where we were allowed to take as many pictures as we like. Back through the first corridor, down the stair and back to the floor of the cathedral. We lingered for a bit, enjoying the stunning architecture, but it was closing to tourists as the evensong was beginning (something we highly recommend doing). It was a real treat to visit St Paul’s Triforium, and we highly recommend it to anyone who has an interest in the architecture and construction of the cathedral. Even with the closure of the library for the next 18 months, it’s still very much worth taking the tour. If you go: To book, watch this web address: https://www.stpauls.co.uk/sightseeing-times-prices/guided-tours – you’ll get an idea of dates and times. You have to email or call to book your tickets. You can’t book online. There are 141 steps up to the Triforium, and there are no lifts, unfortunately, so it’s not accessible for those in wheelchairs. It’s £8 (about $10) on top of your admission ticket to the cathedral. Thanks for the tour description and the photos. I’ve been to St. Paul’s several times, but never knew about this tour. It’s been 33 years since I was in London but I remember it like it was yesterday. My daughter and I walked up to the Whispering Gallery and i thought I would have a heart attack. But it was worth it. I also saw the wooden model and I have a photo of it. I love London! That looks and sounds pretty cool. I’ll have to check that out in 2020. I can already smell the “nerd perfume.” Love it.